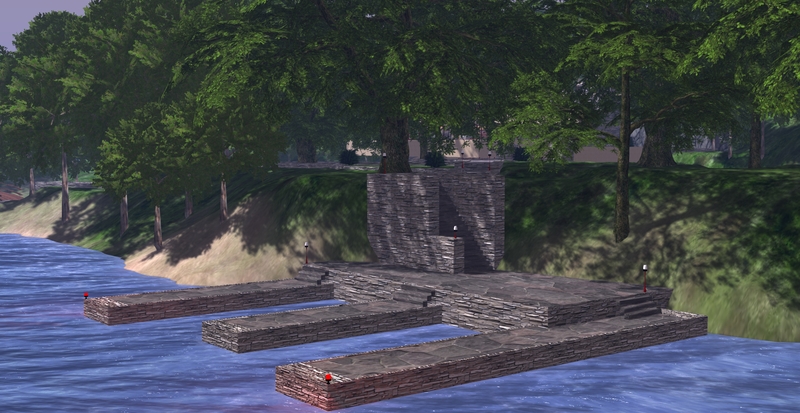 Back in mid-June, I mentioned that Fallingwater (Kitely) was relocating to the Seanchai Library core world there, the result of conversations between Caledonia Skytower, Shandon Loring and myself. In that report, I covered the physical move itself, relocating the house from a single region to the Seanchai 2×2 core megaregion. Since then, and as time has allowed, I’ve been gradually re-working the place. Truth be told, I’d never really got it to a “completed” state in two years of having it on a region of its own, and the build really needed some TLC to get materials, etc., properly blended (I’d only just started messing around with them when I stopped working on the place in 2013). There was also much I was less than pleased with in the landscaping – such as the driveway up to the garages and Guest House, the river, and the falls, which I’ve always wanted to re-work. As the house is now part of a themed estate (albeit one where each region effectively has a theme of its own), the land around the house needed a degree of blending so that it would fit the lay of the rest of the estate, and this gave me the excuse I needed to shovel through everything that I’d never really made the time to sort-out. First and foremost. the falls received a complete face-lift. I’ve always been unhappy with how they looked throughout each iteration of the build, either in SL or Kitely; they never seemed to quite capture the spirit of the original. I’m a lot happier with the re-working. They’re still not “Fallingwater’s” falls – the rocks there are far more angular, but I think I’ve captured more of their “feel” at last. Reworking the land meant I could get rid of the two roads leading up the house and replace them with gravel paths with brick shoulders. One of these. I decided, should lead to a stone jetty offering plenty of mooring pace for boats (water is a major feature in the estate), and the other I reworked as the main path connecting the house to the rest of the estate, reach via a bridge spanning the mouth of the river, and which I nabbed from Shandon and reworked a little, adding some wood texturing. As the house is to be a venue for storytelling, providing space for people to gather has been an important consideration. So to help with this, I decided to thin out the trees a little and provide a couple of open-air spaces which might be used for smaller gatherings. 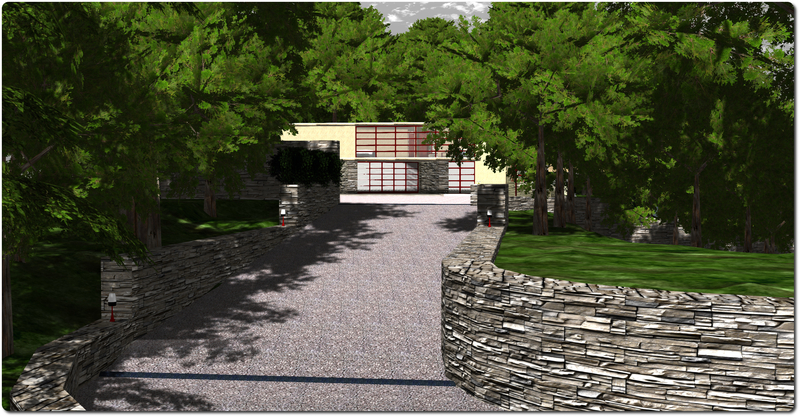 One sits in the curve of the completely re-work driveway (I hated the original in the build, and while I’ve not found any sign of the walls I’ve installed along the drive in the drawings I have of the real Fallingwater, I think they fit the place rather well. beyond the drive, and outside of the walled parking area is another area cleared of trees and which faces out over open ocean to the north, as another space for informal gatherings. Cale also requested that I provide a space which could be used for meetings, workshops, social events and suchlike, again in keeping with the overall design of the house. This left me stumped for a while, but in the end I came up with a combination of a large cantilevered terrace extending out over the ocean on the northeast side of the island, and a building styled after the Guest House and offering two connected rooms. hopefully these will together provide flexible space for hosting indoor and outdoor events. A set of steps leads down to another set of piers below, and a path arcs around the headland and down to a small cove. This all sits well below the lie of the rest of the land on the north side of the island, and so hopefully also offers a feeling of isolation from the rest of the build – although a path does link it to the pool patio by the Guest House, the patio also having been extended to provide a further venue for small gatherings. I’ve add new lighting to much of the outdoors areas – lamps which come on at dusk and turn off again at dawn – which hopefully add some more ambience to the place. There are still some nips and tucks to be taken care of, but overall, I think the major work is done – subject, of course, to Cale and Shandon being in agreement. 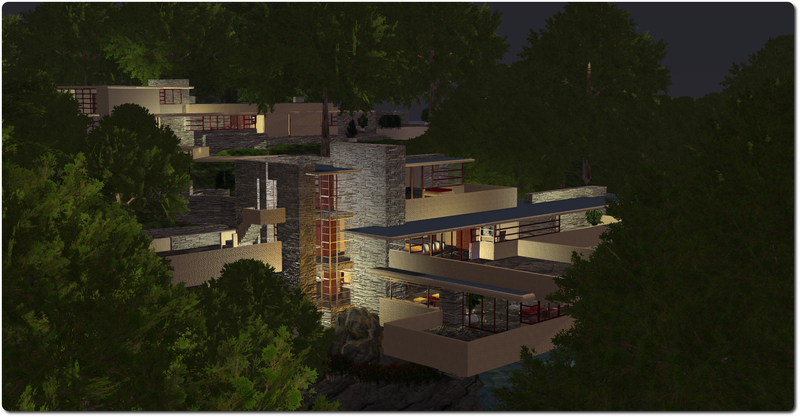 I doubt this is the end of my infatuation with Fallingwater; I rather suspect that were the opportunity to arise, I’d happily start fiddling with the SL version once more. However, where Kitely is concerned – given that I have so little time I can spend there – I’m really happy that Fallingwater has a new home and will be put to good use. 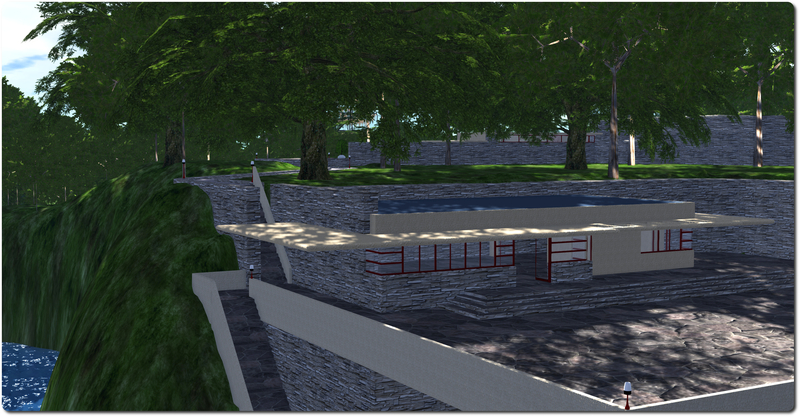 You can visit Seanchai Library in Kitely via the Seanchai Library Kitely web page or via a hypergrid teleport from any hypergrid enabled OpenSim grid via: hop://grid.kitely.com:8002/Seanchai/144/129/29 (main arrival point, Fallingwater is to the northeast). I “borrowed” a copy of one of the bridges connecting the various locations in the estate to provide a physical and thematic link between Fallingwater and the rest of the estate. Fallingwater, Seanchai Library, Kitely.